HUDSON — Elsie L. Bixby, 93, formerly of Hudson, died Monday, March 21, at Hillcrest Home, Sumner. She was born May 28, 1917, in Fayette County, daughter of Arthur and Louisa Seick Frisch. She married Edward Bixby on June 25, 1950, in Nashua. He died April 27, 1996. 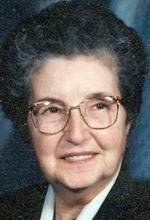 Mrs. Bixby worked at John Deere during World War II and at Montgomery Ward’s for 13 years, retiring in 1979. Survived by a sister, Hazel Schwerin of Sumner. Preceded in death by her husband; a son, Robert; two brothers, Russell and Eldon Frisch; and a sister, Edna Gudzus. Services 11 a.m. Friday at Hudson United Methodist Church, with burial in Hudson Cemetery. Visitation an hour before services Friday at the church. Locke Funeral Home, Waterloo, is in charge of arrangements.